The study of natural populations has been revolutionized by Next Generation Sequencing (NGS), which enables us to obtain genome-wide data from multiple individuals and populations. Such data hold the potential to resolve questions about the evolutionary history of a given species, which can have important implications for conservation. However, even though we are facing a flood of genomic data, we currently lack tools to analyse such large datasets. I will illustrate how model-based approaches can be useful to reconstruct the past evolutionary history of populations by describing a flexible composite likelihood method based on the site frequency spectrum (SFS). This method allows us to use genome-wide data to test alternative demographic scenarios and infer relevant parameters, such as migration rates, population sizes and times of divergence. 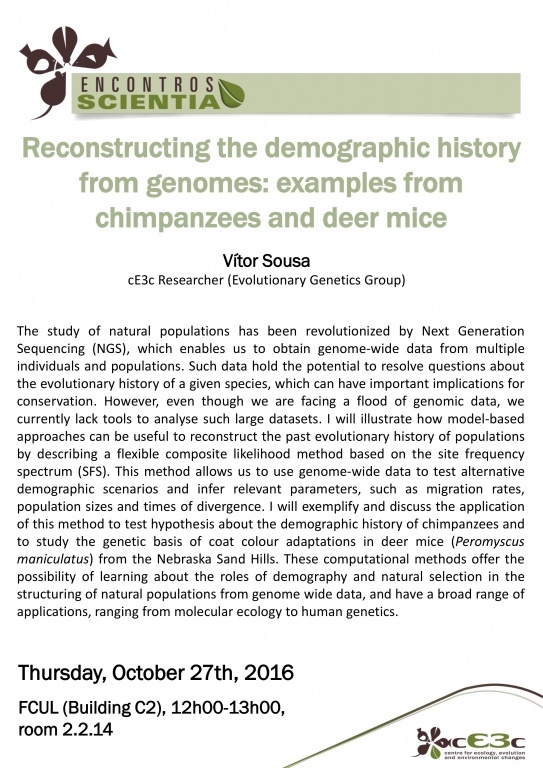 I will exemplify and discuss the application of this method to test hypothesis about the demographic history of chimpanzees and to study the genetic basis of coat colour adaptations in deer mice (Peromyscus maniculatus) from the Nebraska Sand Hills. These computational methods offer the possibility of learning about the roles of demography and natural selection in the structuring of natural populations from genome wide data, and have a broad range of applications, ranging from molecular ecology to human genetics.